Mohali: Skipper R Ashwin struck at crucial times while KL Rahul scored a matured half century to help Kings XI Punjab return to winning ways with a 12-run victory over Rajasthan Royals in an Indian Premier League (IPL) clash here on Tuesday. Chasing 183 for victory after KL Rahul helped Kings XI post 182/6 with a well-paced 52, Royals were on course with 94 needed off 60 balls. But Ashwin (2/24), whose 4-ball 17 run cameo proved to be the difference in the end, removed Sanju Samson (27) in the 12th over to break the 59-run second wicket stand with Rahul Tripathi (50 off 45 balls) and then got the back of Tripathi in the 16th over to further dent Royals’ charge. After Tripathi’s dismissal, the visitors needed 56 off 24. But Ajinkya Rahane (26) failed to lead from the front once again and Stuart Binny’s unbeaten 11-ball 31 too proved futile in the end as Kings XI won easily at the end. Royals managed 170/7 in 20 overs. Besides Ashwin, Mohammed Shami (2/46) and Arshdeep Singh (2/43) also got two wickets. Royals were off to a flying start despite losing Jos Buttler (23) early. Tripathi and Samson were going about their job perfectly when Ashwin first castled Samson and then also did not allow Rahane and Tripathi to guide the team through as the batsman holed out to Mayank Agarwal at long off. Once Rahane was gone, Ashton Turner (0) failed on debut while Jofra Archer (1), who starred with the ball, could not impress too. Earlier, buoyed by a World Cup call-up, KL Rahul struck a well-timed fifty but Archer stole the limelight from him with splendid figures of 3/15 as Kings XI Punjab posted 182/6 after being asked to bat first. Rahul, who was included in the 15-member World Cup squad on Monday, took 47 balls to score 52 with the help of three fours and two sixes. David Miller (40 off 27 balls) also played a vital role as the pair stitched together a 85-run stand for the third wicket. But Archer bowled a brilliant second spell to not only snare two wickets in the same over but check the run flow, before Kings XI skipper Ashwin played a 4-ball 17 run cameo to take the score past the 180-run mark. Rahul started very slowly and was 13 off 23 balls at the halfway stage. But then he shifted gears seamlessly before getting out to Jaydev Unadkat (1/48). Kings XI lost Chris Gayle 30 (22 balls) early, with the veteran southpaw edging a Jofra Archer delivery to Sanju Samson behind the stumps. After the Power play overs, the home team were 39/1. Agarwal could not convert his start, as his whirlwind 12-ball 26 cut was short by Ish Sodhi with Archer taking a brilliant catch at long on. Rahul and Miller then upped the ante in the 14th and 15th overs with 39 runs coming from them. Rahul brought up his 14th fifty in the IPL in the 17th over, milking Archer for a sublime boundary between cover and mid-off but Unadkat made amends for getting spanked by the India right-hander earlier, by removing him in the 18th over, with Archer taking the catch at point. Archer then removed Nicholas Pooran (5) and Mandeep Singh (0) in the 19th over before Dhawal Kulkarni accounted for Miller, the South African trying to clear wide long on and instead giving wicketkeeper Jos Buttler an easy catch in the final over. 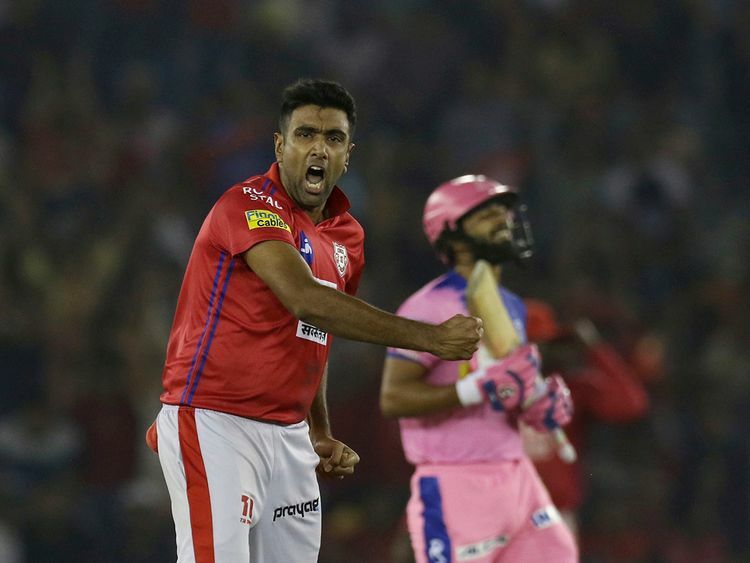 But just when it looked like Kings XI would finish with a whimper, Ashwin led from the front by smashing a four and two back-to-back sixes off the last two balls to finish on a high. Brief scores: Kings XI Punjab 182/6 in 20 overs (KL Rahul 52; David Miller 40; Jofra Archer 3/15) vs Rajasthan Royals 170/7 in 20 overs (Rahul Tripathi 50; R Ashwin 2/24, Mohammed Shami 2/46, Arshdeep Singh 2/43).